New website makes it simple for customers to order custom chair mats from Quality Chair Mats. Quality Chair Mats launches new e-commerce website designed to enhance user experience. The website features clean lines and a modern, easy-to-use interface. 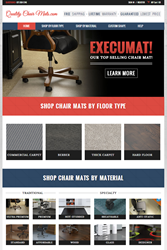 Quality Chair Mats is excited to announce the launch of its e-commerce website, http://www.qualitychairmats.com. A manufacturer and retailer of custom, durable chair mats, Quality Chair Mats provides chair mat solutions for all types of floors and spaces. Shop by floor type: If customers would like to shop for a chair mat specific to a floor type, such as thick carpet or hardwood, they have the option of shopping by floor type. Shop by material: If customers are looking for a chair mat made of a specific material, they can shop by materials like wood, glass, anti-static, and more. Traditional and specialty chair mats are available in various colors and materials. Custom shape: Customers also have the ability to customize the size and shape of their chair mats by downloading a worksheet and entering custom measurements. Complete with high-quality product images and informational descriptions, the Quality Chair Mats website makes the shopping experience enjoyable for office managers, homeowners, or anyone looking to add a chair mat to their space. The Quality Chair Mats website was created by Artonic, a web design and marketing firm based in Michigan. Designed to simplify the user experience, the website features clean lines and a modern, easy-to-use interface. Quality Chair Mats offers free shipping on all orders, a lifetime warranty, and a guaranteed lowest price on chair mats. For more information, visit http://www.qualitychairmats.com, email sales(at)qualitychairmats(dot)com, or call (877) 269-1248.